Last night, on the eve of summer, our community garden had its first happy hour of the season. As the sun set, we shared locally brewed beer, sliced apples and strawberries, pie from the bakery up the street and my first attempt at goat cheese. Besides congratulating a newly married couple, and toasting another gardener’s birthday, we talked ideas: a pizza oven modeled after a community dining experience my plot neighbors’ had in Martha’s Vineyard, a shared chicken coop (or Group Coop as I dubbed it), a bee hive. How many of these might come to fruition and how quickly was unknown, but we knew anything was possible: we had coaxed food from the barren ground together, year after year. As the light waned, I thought about how much I appreciated this community of neighbors who might never have met had it not been for our shared green space. Our gathering also helped me reflect on the growing season thus far. I had been visiting the garden most days to water or weed, and more frequently to start harvesting, but hadn’t given much thought to how lush the garden had gotten in the past month or so. It took my community of gardeners, taking collective stock of our individual spaces on the last day of spring – asking questions and offering advice – to help me realize the miracle of growth that we had experienced in such a short time. The above picture was taken in the past week, and shows the very lush horseradish in the foreground. The edible root is underground, but I have read that the leaves can be eaten as well and I intend to try them soon. The horseradish leaves became very huge very fast, and I decided to take advantage of the shade they would provide by planting my lettuce beneath and around them. Even since this picture was taken they have grown enough to start harvesting. Behind the lettuce is fennel, kale, chard and tomatoes, most grown from seed and all days or weeks from harvest. The picture above was from mid-May and shows the garden from the perspective of a different corner. The small (probably) squash seedlings are in the foreground next to the always prolific mint. I say “probably” because these sprung from composted dirt in pots in my backyard. They looked so healthy that I thought I would transplant them to see if they might make it – it is now a month later and they are doing very well. This also shows the healthy strawberry plant in the center-back of the plot, which has already produced a few quarts of berries and will likely keep going for another week or two. This plant was another “volunteer” from a few seasons ago that I couldn’t bear to pull up, so I’ve left it to mature and this is the first year that I have gotten a real strawberry harvest. Which was a nice reminder that it pays to be patient with plants. I’ve been exercising that same patience with rhubarb plants in the back left corner that have taken two seasons to flourish and should be producing enough for a spring harvest next season. And lastly, a picture taken around the first day of spring. The sprouts are garlic, planted last fall. This is taken from the same perspective as the top photo, as a nice comparison (and reminder) of how much can happen since the start of spring. I remember the day I took this photo – it was an unusually nice day for March, maybe fifty degrees. I recall being excited for my first glimpse of my plot for the year; that was the moment that I could finally imagine that the especially cold and snowy winter might be behind us. It is now that I realize that even then I was thinking of the garden as a group. We all had survived the same winter and would start to look to each other for cues on what to expect next. Even if our paths did not physically cross until last night on the eve of summer, I felt my community’s presence: I could see my neighbor’s garlic sprouting alongside mine and shared extra seedlings in the designated spot alongside the shed. While from one perspective the season of bounty is just upon us, in other ways I realize that it had never ended. After a particularly harsh winter, I finally spent some quality time in the dirt this past weekend. Because it had been so long, I relished the soil under my nails, the shoveling, raking and dragging around of heavy things. First, I spent the afternoon at the community garden, adding compost tea to the dirt, raking up errant leaves, pulling the last few stalks from last fall and planting some rows of beet, chard, curly and blue lacinato kale, lettuce, arugula, beans and carrots. While it is a little early for the more tender seeds and seedlings, like most herbs and tomatoes (the latter of which I plan to plant among the garlic sprouts, above. Finally, I’m planning ahead for companion planting! ), I’ve had good luck with these hardy seeds in the past few years. We might get a(nother) cold snap and perhaps lose some, but that is a risk I’ll take. The next day I worked on our (very small, mostly paved) yard. I was inspired by the Somerville Garden Club‘s bi-annual garden tour, where I saw berry bushes in narrow, shady corners of yards, and grape vines climbing all sorts of trellises and fences. If my neighbors can grow them, so can I, I decided. I bought two raspberry bushes for a back corner of the yard, adding new dirt and compost tea to the planting area to fortify the existing rocky and silty soil. I added a similar mix to a large square pot for the Niagara grape vine that I also purchased. Spring and fall are the best time for planting fruit bushes, trees and vines and I wanted to get mine in before summer snuck up on me. Each of these seedlings had to be soaked in water for a few hours before planting. I transferred the contents of my indoor composter into the bottom of my tomato pots. What you see above is compost started about 3 or 4 months ago. As you can see, the Bokashi accelerator does a great job, well, accelerating the compost. Just like last year, I added about six inches of compost to the bottom of the tomato pots and transferred dirt from last year’s pots on top. I noticed a few tiny eggshell pieces in some of the dirt I was transferring and realized that the eggshells were from last year’s compost-turned-dirt. Basically, the circle of life in action, with a little help from me. Grow the veggies, put the scraps in the compost, cover with dirt, grow more veggies, add compost-turned-dirt to new pot and repeat. Just a few more weeks and I plan to hit up the Waltham Community Farm seedling sale for tomato and herb seedlings for the garden and the yard. I can almost taste the caprese…. Perhaps I should have dug these out a bit sooner…. I can’t say that I was waiting for anything in particular. But the holiday season was upon me and then the next thing I knew mother nature dumped a foot or so of snow atop my urban potato patch. But I was inspired by that old adage that one should ring in the new year doing something representative of one’s hopes for the next 365 days. Thus, what would be more symbolic – and delicious – than digging in the dirt to see if I did, indeed, grow sustenance in my urban oasis that could be plucked from the earth in the depths of winter. I created a video of my potato patch adventure, and the end result (spoiler!) is that my leaf cover did, in fact, work as did my potato-growing experiment in a shady raised bed in the back of my very small and mostly paved back yard. The end result was a small pile of potatoes which later joined some turnips and rutabegas from our Red Fire Farm winter share that were steamed and then mashed with butter and a drizzle of truffle oil. Homegrown, local farms and a bit of decadence: that pretty much spells out what I hope 2011 will bring. Happy New Year! I plucked this very carrot – this rather large Atomic Red carrot grown from seeds purchased from the http://www.rareseeds.com catalog – from beneath my six inches of leaf cover in my community garden this past weekend. Saturday I stopped by the garden for the first time in a few weeks. We’re still getting our semi-weekly farm share, and I have been stocking up in my make-shift root cellar, so I had not needed to tap into the last hardy rows of kale, leeks and carrots left at the garden. But I was having a little holiday get-together and I thought that these red beauties would make a nice addition to my veggie plate. Sure enough, the ground was frozen rock solid. The air temp was above freezing, however, so I plucked the last of the blue lacinato kale (also known as dinosaur kale) leaves, which were doing surprisingly well having weathered a few weeks of cold weather. If you plan to leave your kale in the garden past the frost date, I read that it is best to pick the leaves in weather that is above 32 degrees because the thawing allows the water to redistribute and ensures better storage and taste. After a few weeks of freezing and thawing while living in the garden, the leaves looked as healthy as they did in October. 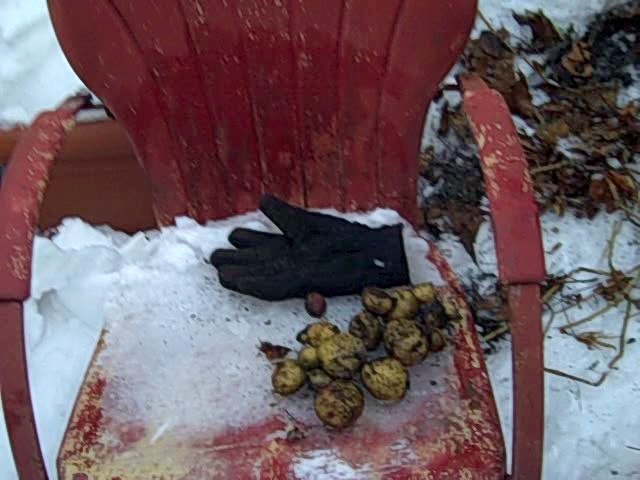 The ground was too frozen to dig up the stalks, however, so I guess those are staying in til spring cleaning. I also pulled the leaves back that were covering the roots of the row of leeks that I left in the ground. I was pleased that I could get my shovel in where my leaves had been insulating the dirt and the leeks were healthy. Same with the carrots – the leafy green tops were just starting to die down beneath the mound of leaf cover, and it was easy to dig out a few Atomic Reds to show off that evening on my snack table. Verdict: the leaf cover experiment worked! Even as I type that blasted word on a day that is certain to reach into the 60s, I know that winter is around the corner. While I love warm weather and start counting down the days until I can leave the house without a jacket as soon as my hangover eases on New Years Day, I recognize – and have been trying to embrace – winter. Despite the deep chill I feel from November until mid-March, I realize that I need winter’s break to catch up – on housework, writing and eating the food I’ve been freezing and canning and storing since late spring. And I must admit, that once my semester got under full swing by late September (and my first batch of 100 papers to correct kept me in the house on a beautiful fall afternoon) which coincided with the peak of the farmer’s market and farm share bounty (thus lessening the need to shop from my own plot) my garden and yard began to feel a bit neglected. I am trying to remind myself that I need winter’s break to become excited again and reassess what worked this past season and prepare for any new projects. But winter isn’t here yet. As I noted it is nearing 60 degrees for perhaps the last time in 2010 and I must put aside the correcting and planning and spend some time in my yard. Luckily my husband and I have been busy and, well, a bit neglectful of the fallen leaves in our yard. After an initial clean-up a few weeks ago, we now have a new covering to be dealt with before they turn brown and damp and unsightly. I plan to rake into a pile and use some of it as mulch. Leaf Observation: have you ever been as lazy as I and left a pile of leaves along, say, the edge of your driveway for the winter? And then finally got around to cleaning it up some spring? And noticed that the leaves have started to turn into what appears to be dirt? Well I plan to focus that natural dirt-making process by using leaves liberally this year to surround the roots of my perennials and even cover some veggies that I am going to try and overwinter (like carrots and potatoes). The Brief How-To: In my research, many places note that leaves should be shredded to break down quickly enough as mulch. Well, I don’t know about you, but the only shredding tool I have is a paper shredder (although a lawn mover can be used as well). My leaves will stay whole. However, I will spread them thoughtfully around the base of my cut-back plants, as they will keep everything beneath them quite damp. Also, come spring I will add slow-release nitrogen fertilizer to help restore the ph of the soil from the composting leaves. And when I start to see some shoots of green in the spring (I can’t help myself! I just can’t wait for that day, just four months from now!) I’m going to help clear the way for the ground to warm up and spring to start showing itself, so I’ll give a light rake and pile up the top layer of leaves that didn’t have time to break down over the winter. They should take about a year to fully return to dirt, so perhaps I’ll make a little leaf compost pile in the shadiest corner of my raised bed and see what comes of it.